You guys. I made a cheese ball. Yes, another cheese ball. But this one is spicy, so it’s totally my jam. And guess what? Now you have something delicious to serve your dairy sensitive / vegan guests as they arrive at your party! Isn’t that grand? This cheese is simple to make, requiring just 10 ingredients and surprisingly simple methods. If you can soak and blend cashews with spices and then wrap it in a towel, you can make this cheese. I believe in you – you got this. The base is soaked cashews and vegan cream cheese for extra creamy texture and a little tang. The cheesiness comes from nutritional yeast, and the spice comes from garlic, smoked paprika, pimento peppers, and cayenne pepper. This combination of ingredients creates a seriously dreamy cheese ball that’s spicy – but not too spicy – and insanely flavorful. Once the cheese has had some time to rest in the fridge, it becomes semi-firm and moldable, but remains creamy – that’s what you want. This is an optional step, but I chose to coat mine in a blend of the spices for extra kick: paprika, nutritional yeast, cayenne, salt, and chili pepper. Plus, look at that color! I couldn’t resist. This would make the perfect appetizer for Thanksgiving, or anytime of year! It holds its shape for 2 hours outside of the fridge and keeps up to 5 days making this a great recipe to make ahead of time and set out just as your guests arrive. You so fancy. If you try this recipe, let us know! Leave a comment, rate it, and don’t forget to tag a photo #minimalistbaker on Instagram. This is recipe #4 in my Thanksgiving Week Extravaganza – a series where I post a new recipe every day leading up to my Thanksgiving round-up on November 23. That way you’ll be completely covered for the big day. More to come, friends! 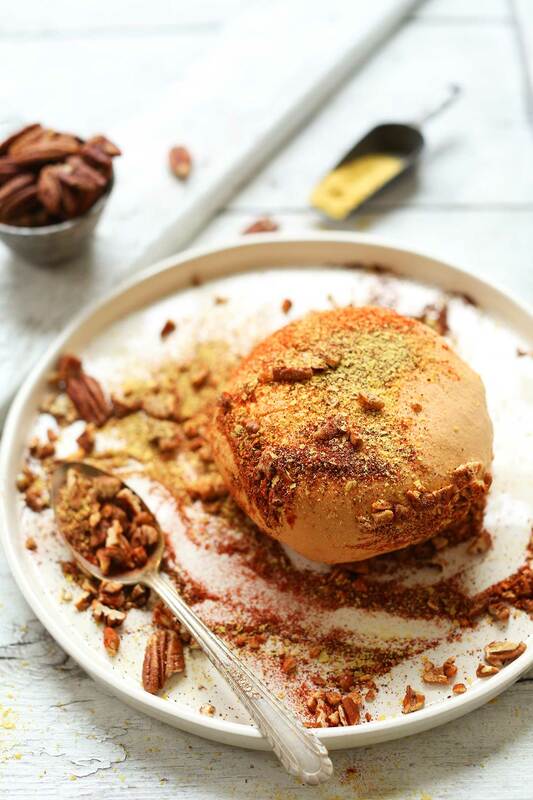 10-ingredient spicy vegan cheeseball with pimento peppers and nutritional yeast! Creamy, simple to make, and incredibly flavorful! The perfect holiday dip! Place cashews in a bowl and cover with cool water. Soak overnight or for at least 6 hours. If you can't get to them right away, drain, place back in bowl, and cover with plastic wrap. They will keep refrigerated for up to 2 days. Although not ideal for this recipe, you can also quick soak the cashews by covering with boiling hot water and soaking for 1 hour, then draining and proceeding with recipe as instructed. 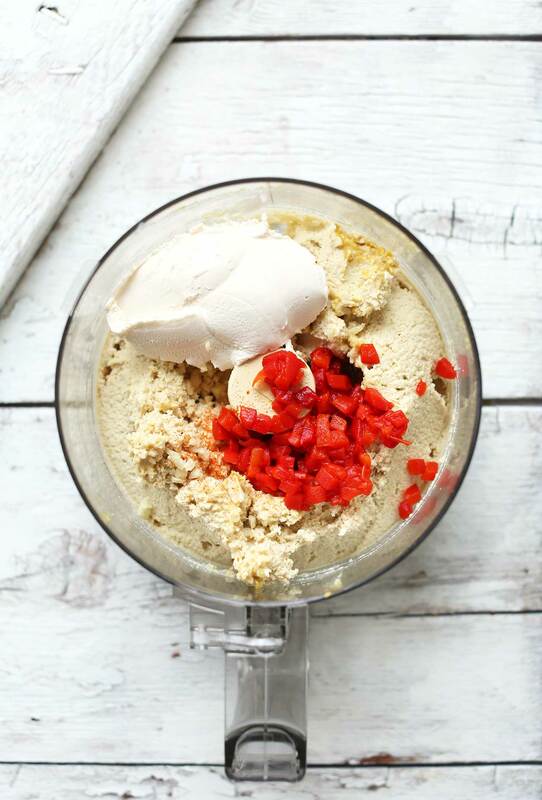 Once soaked, drain cashews thoroughly and add to your food processor (or a blender - though it's a little tougher to blend as there's not that much liquid added). Add minced garlic, garlic powder, lemon zest, lemon juice, nutritional yeast, salt and olive oil. Blend until very creamy and smooth, scraping down sides as needed. Then add vegan cream cheese, pimento peppers, smoked paprika and cayenne (optional). Blend once more until creamy and smooth. Taste and adjust seasonings as needed, adding more lemon zest for tartness, nutritional yeast for cheesiness, garlic for zing, salt for saltiness, paprika for smokiness, or cayenne for heat. I added a bit more nutritional yeast, salt, cayenne and paprika. You want this to be super flavorful, so don't be shy! Place a fine mesh strainer (or colander) over a medium mixing bowl, and lay down two layers of cheesecloth (or a clean, fine, absorbent towel). Use a spatula to scoop all of the cheese over the cheesecloth, then gather the corners and twist the top gently to form the cheese into a "disc." Secure with a rubber band. Place in refrigerator to set for at least 6 hours, preferably 12-24, or until semi-firm to the touch. There likely won't be any liquid in the bowl, but the cheesecloth absorbs excess moisture and the cheese hardens in the refrigerator. To serve, unwrap from cheesecloth and gently invert onto a serving platter. Reform with hands or cheesecloth as needed. To make coating (optional), mix together nuts and spices and use hands to gently roll the ball around until coated. It is fragile, so handle gently. Enjoy immediately with crackers, vegetables or tortilla chips. I prefer this cheese with crackers or chips because it pairs better with carbs than vegetables in my opinion! Cheese will hold its form for 1-2 hours out of the refrigerator, but best when chilled. Leftovers keep well covered in the refrigerator up to 5 days. *If you can't find vegan cream cheese, simply omit it. It adds extra creaminess and a slight tang to the cheese, which I loved. But this isn't a critical ingredient. *Prep time reflects soaking cashews for 6 hours, making the cheese for 30 minutes, and chilling for another 6 hours. This recipe is awesome. I did mot make it into a ball, but used it as a spread and got rave reviews. Turned out great! It made a VERY generously-sized cheese ball, too. I soaked the cashews overnight, then and left the cheese ball in the fridge overnight too. I think this method worked perfectly: the cashews blended easily and the ball firmed up beautifully. I left out the pimentos (couldn’t find them in my local stores) and I skipped the coating as well; instead I spooned Trader Joe’s mango-ginger chutney on top. It was absolutely delicious and the texture was uncannily similar to cheese spread! Very simple to make, too. This is definitely going to become of my go-to party appetizer recipes. I made this recipe last week for guests and they loved it. They tolerated all my iterations working with Agar Agar and none of us were ever satisfied with the results. I figured I would try one last time to make a cheese. My beloved carnivores devoured the cheese ball! I served it with assorted crackers and it was gone in 15 minutes. Thank you, Dana, for another great recipe. This is an incredibly delicious recipe. I didn’t have pimentos so I diced a red pepper as a substitute. I served it at a cocktail party tonight and everyone loved it! The recipe yielded enough to make 2 balls so I froze one. Tomorrow I am making spinach lasagna with your ricotta …it’s a house favorite. Thank you Dana! I’m going to make this tomorrow. Super excited!! Can you please tell me if you measure your cashews by volume or weight? We use 2 cups (240g) of cashews. I made this for a party and it was a hit! Most of the people attending were non-vegan cheese lovers, but this was the only thing that got finished. I didn’t leave it in the fridge long enough to solidify, so served it as a dip instead of a ball. So good I can’t wait to make it again! Just made this recipe for a Friendsgiving appetizer and it was a HUGE success. We had 12 people, both vegans and non-vegans and everyone loved it! The consistency and texture were great – just like a soft cheese. The taste was fabulous – even the non-vegans were obsessed. One even said they wouldn’t have known it wasn’t cheese! I followed the recipe exactly and, having never made anything like this before, I didn’t run into any problems. It makes a pretty large cheese ball, so it’s great for parties! 10 out of 10 would recommend to a friend. Would adding agar agar or tapioca starch affect the creaminess, and would it be able to help the cheese form into a ball better? Hmm I’m not sure, Alisha. If you experiment with it, report back on how it goes. Good luck! This is so easy to make and is yummy. While the cashews soaked overnight, I measured the other ingredients and the next day it took less than 5 minutes to finish. The most difficult aspect was dealing with the cheese cloth. I added extra garlic, salt, and smoked paprika. I used ‘Follow your Heart’ cream cheese which unfortunately is not tangy – (next time I’ll use Kite Hill, which tastes the same as dairy based cream cheese). The last item I added to the did processor was ‘Follow Your Heart’ parmesan shreds which upped the cheese taste immensely. I’m looking forward to the next time I make this because I’m going to add jalapeno powder, and to mimic the tanginess of cheese without the added calories, I’m going to add Apple cider vinegar. This is such a versatile recipe and can actually be a dip if you don’t want to wait to dig in. Thank you for this delicious recipe. My daughter made this for Thanksgiving but it would be wonderful for any gathering. I am still amazed at how good this is and how easy too. I just started soaking my cashews and am so excited to make it myself. They sell the cheesecloth at the grocers where the kitchen tools are sold, generally. Minimalist Baker, you are the Best!! Hey Dana! I just stumbled on your recipes and they all look amazing! I would like to give this cheese roll a try but I am very sensitive to oils (flaxseed oil seems to be the only one I don’t react to). Would it be a cheese-killer if I didn’t include the olive oil? or replaced it with flaxseed oil? Hi Lucy! That should work! Where I come from you can not get vegan cream cheese:( Is there is something else you can use? I made this as an appy for dinner with some non-vegan friends. It turned out great and everyone loved it! I froze the leftovers and it thawed out perfectly for a snack a couple weeks later. This looks amazing. I have a tree but allergy so vegan cheese is quite tricky for me. Any suggestions on cashew substitutions, or another type of tree but-free vegan cheese that I could look out for? Sorry, tree *nut* allergy ? Hi Kath! Hmm, I’m not sure! That’s the closest match I could think of, besides sunflower seeds. Hope this helps! What do you think about adding green onion and/or some dijon mustard, and even pickle juice to this recipe? trying to get it closer to the Whole Foods version that is to DIE for! If you’re thinking about making this recipe, DO IT! It was easy, and so, so tasty. 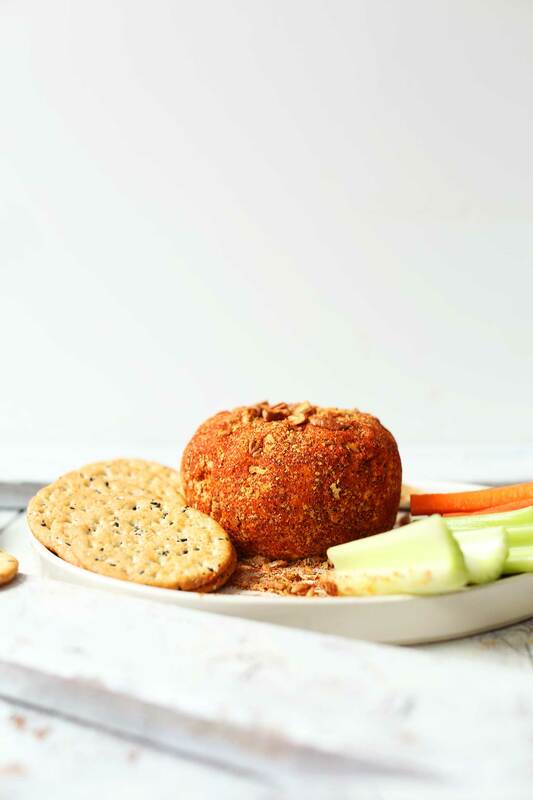 I halved the recipe and it still gave me a substantial sized cheese ball–enough for 4 people to nosh on in a sitting, or one person to hoard…err, enjoy over a few days. I used Daiya Chive cream cheese and upped the Smoked paprika and cayenne quotient a bit to suit my preference. My theory is that the further away one gets from eating dairy/real cheese, the more vegan cheese actually tastes like the real thing. Regardless, this cheese ball is delicious! I will definitely be making it again. Thanks for this recipe! Any chance of a quick edit? I love Sea Salt, but the optional “pus” is just too gross for this old vegan gal! Thanks for sharing your talent and hard work! This is fantastic! Thank you for working hard to put together such yummy things!! I made this and it was super tasty. I couldn’t find pimento so I used some roasted red peppers from a jar (drained). Any idea where would I find jar pimento peppers? Question: Is the cheese supposed to be firm? After 12 hours the cheese was still quite wet and I had difficulty shaping it into a ball. Any suggestions on how to make it more firm? Also, can I freeze it?…as it made a lot. Thanks for the recipe – I will make this again! I found mine at Whole Foods! But most grocery stores have them! To make it more firm keep chilling in the fridge! Thanks so much for the reply… I will check there the next time I go. I made this and it was delicious! I want to try it with almonds instead of cashews. Would that work? And would I soak the almonds the same way? I love your recipes! Start with blanched almonds for best results. I haven’t tested it this way but think it would work! Yes, they still need soaked. Made this for Thanksgiving and it was a giant hit in my carnivorous dairy-loving family. By some miracle I was able to smuggle some leftovers home. Today I turned it into a vegan pimento grilled cheese sandwich. Life changing! Thank goodness I had limited leftovers or I would have continued eating until I could eat no more. Thanks for the wonderful and delicious recipes! Oops, forgot to rate it! Hey lady! I made your cheese ball for Thanksgiving for my guests and we all absolutely loved it! I couldn’t keep my brother from hogging it all, lol…he kept going on and on about how delicious it was! I didn’t make mine early enough, so it wasn’t quite firm enough to roll into a ball and more of a cream cheese spread texture, but we didn’t care, it was just fabulous! We just dipped our crackers in it and were super happy. I followed your suggestion and added more cayenne and smoked paprika and I also added some liquid smoke because I’m obsessed with smoky flavors. Great recipe! I have some left and will try to get a pic and post it on IG! This cheese ball was amazing! I omitted the oil and it still came out perfect. I served it with pumpkin spice triscuits. It’s beautiful for the holidays or any occasion. Love, love, love! Hope you don’t mind me replying. I have a Cuisinart 9-cup and love it! It was around $100. Hi there! Try this one. Y’all. This was absolutely delicious. I made this for Thanksgiving using a few additions from my grandmother’s recipe (+ 1 can rotel tomatoes and a few dashes of vegan Worcestershire), which did made it a bit too watery to form into a ball. Nevertheless, it was tasty enough to fool us Southern pimento cheese experts and was gone before the seiturkey went in the oven. I may just make this recipe again tomorrow. Yum! I made this to take to my family’s for Thanksgiving. Of course I had to sample it before hand! It is so good on crackers. I had to hold back so I didn’t eat too much. I grew up eating a port wine cheese spread that came in a jar and later a little plastic container from the grocery store…it reminds me of that! Thanks for all the holiday recipes! I just wanted to follow up on my review…my family loved this at Thanksgiving! The omnivores and even kids ate it up. My only problem was I didn’t bring enough crackers! I will make this again for my work Christmas party. They are a tough crowd of carnivores, but I am confident this cheese ball will be a hit! This appetizer looks yummy and perfect for this holiday season. The photos as always stunning! Clarification question about the directions – you put the strainer inside the bowl, and then the cheesecloth inside the strainer correct? Yes! Sorry that part was confusing! Random question: from where do you get your cheesecloth? It looks soooo much nicer than mine. Hi there! I got some at a local grocery store. This is off-topic, but from another poster’s comment I learned of and then read about your hair loss struggle. I’m so sorry you are dealing with this. I, too, have suffered hair loss this past year – I’d guess around 25% or more, mostly on the crown. I also had to cut my long hair. I’m in my early 40s, so I’m sure hormones have a lot to do with it. I wish you the best in dealing with this. I love all of your recipes, btw. You are so creative! This looks so amazing, I think I’m going to give it a try for Thanksgiving. We buy Mary’s Gone Crackers in bulk at Costco and I think this would be perfect! I’ve always been intimidated to make vegan cheese but this seems highly doable! 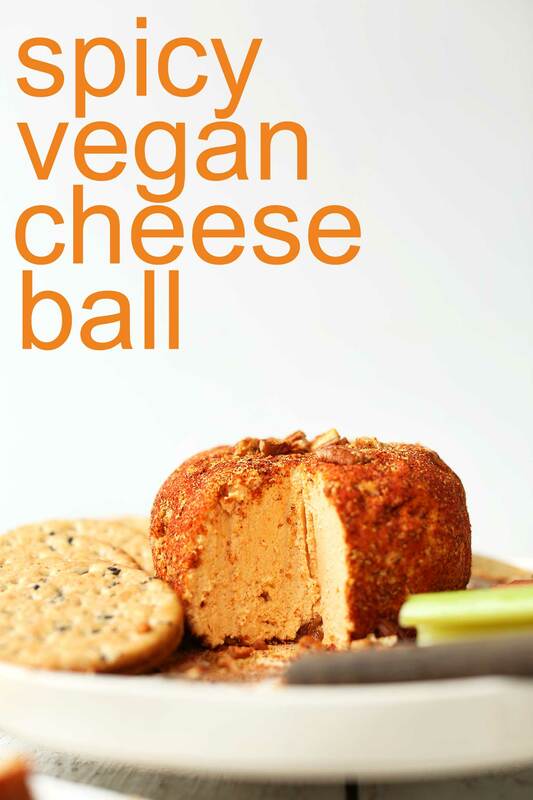 Do these vegan cheese balls truly taste like cheese? Would a cheese lover be fooled into thinking he’s eating cheese? And if it doesn’t taste like cheese, what does it taste like? Hi Laina! I will say it isn’t exactly like cheese, but it’s super close to the real thing. Let me know if you try it! Thanks, Dana for the reply. I’ll give it and try and post here afterwards to let you know how it went. Thanks so much! I love you. Thank you for this. I am in SoCal now and really missing the pimento cheese of the South East, yes!!! We make a lot of your recipes!. just made the lemonbars again .. to die for. But I do have a question and hope you will havethe answer. What app or website or tool do you use to count the nutritional information per food item. I am desperately looking for one. my Daughter is vegan and to know for sure she gets all the macronutrients I have to weigh and count what she eats for a week or so, to be confirmed that it’s probably ok. ..
I’m not Dana, but I am vegan, and pregnant – so I’ve been using a website called Cronometer to make sure I’m getting all the nutrients I need. It’s free and I highly recommend it! Hope this helps. Hi there! I am curious…do you think a mild yellow miso could work for the cream cheese? Hmm, it’s worth a try! Lana did you try it? I’m wanting to maje this for a potluck tonight but i don’t tbibk my local grocery store has vegab cream cheese. I am always tempted by your vegan cheese recipes, especially for my kids who can’t have any dairy products. Alas, they cannot have cashews either. 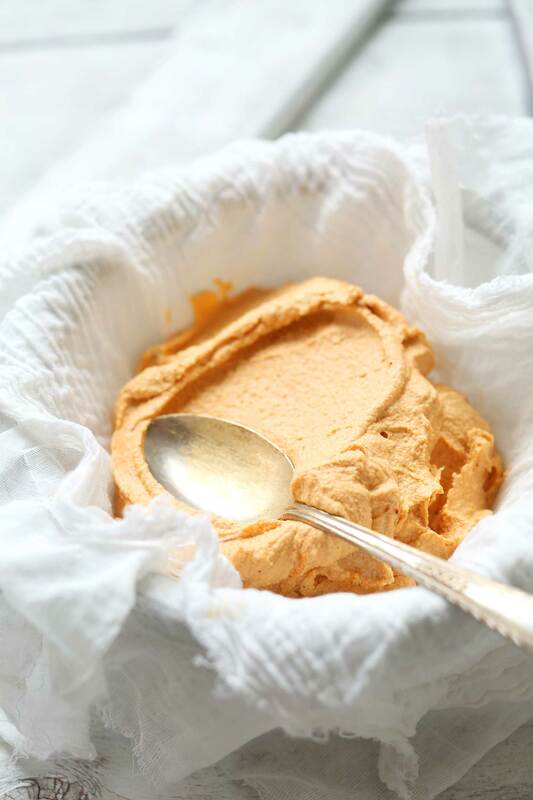 Do you know if we could sub peanuts to all your vegan cheese or sauces made with cashews? Or does it require the specific fat found in cashews? Any other idea for people who are severely allergic to tree nuts and sesame, as my kids are? Thankfully, they are not allergic to peanuts so I manage to adapt some of the recipes. Hmm, I’m not sure! That’s the closest match I could think of, besides sunflower seeds. Looks fabulous Dana! I am having Thanksgiving at my house and I am looking for Vegan options. Most of my family still eats meat products and I am constantly looking for ways of showing them that a Plant based lifestyle if great and satisfying. On another note, I like you have had the same hair loss problem. Thank you for opening up and sharing your struggle with that. Our stories are very similar but it was I that had surgery and then I changed my diet to plant based. Wondering if it was the combination of the two. Still struggling with my hair and it is frustrating! This looks delicious! I’m only having a few people for Thanksgiving so I’m wondering if I could divide this into two cheese balls and freeze one for later. Do you think this would freeze well? This looks fabulous. What a perfect Thursday appetizer! That looks awesome!!! 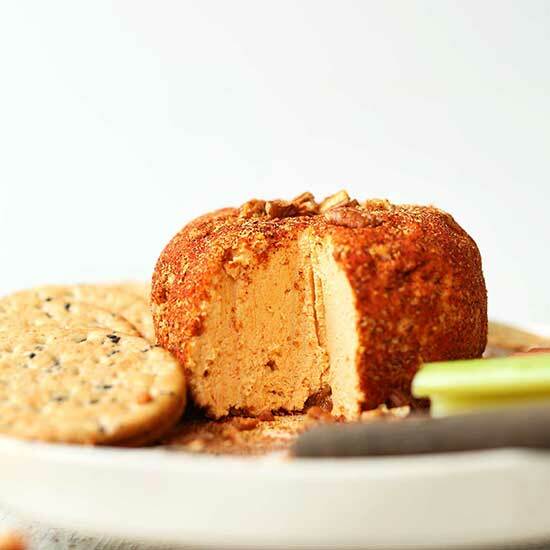 Love cashew cheese and with the spice…perfect!